An intergenerational passing of wealth or the profitable sale of property or business, often raises the question – Is a private foundation the best way to manage charitable giving or would a transfer of assets into a donor advised fund be a wiser decision? The financial meltdown in 2009, in which many foundations experienced a significant decline in the value of their assets as well as heightened Internal Revenue Service interest of all charitable tax incentives, including private foundations, has caused donors to re-think decisions to create private foundations. Many are in fact converting to donor advised funds or supporting organizations that can be set-up very easily at a community foundation. As times change, we are prepared to be informed and adaptable when it comes to organizing your charitable impact. 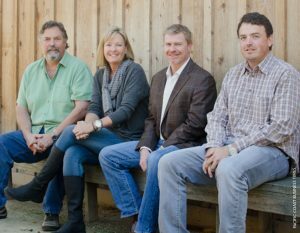 From left to right: Eli Parker, Ashley Parker-Snider, Tim Snider and Kristopher Parker. Photo courtesy of Pacific Coast Business Times. Not only can a donor advised fund have financial advantages to heighten charitable impact, but it can also relieve some of the responsibility for the family or business. Take the Parkers, they are well-known throughout Santa Barbara County and the country for their award-winning wines, beautiful vineyards, and significant presence in the hospitality industry. They’ve always had an affinity for giving back to the community, and eventually started their own private foundation to do just that. The Parker’s support many groups, each organization having a special place in their heart, and the vineyards are frequently approached with requests for in-kind donations of their product. Now that they’ve switched to a donor advised fund, they can be more efficient, thoughtful, and personal in their giving. They have selected several organizations every year to support with in-kind donations, and didn’t miss a beat in their giving plan with a seamless transition. Today, the Parkers are looking forward to continuing their family legacy, and are excited about the prospect of engaging their children and third generation in their giving with their donor advised fund. In thinking about going with a private foundation or a donor advisory fund to support current and future giving, there are three important factors to consider: control, cost and privacy. Having control over where grants go, and how funds are distributed and invested, are key factors in determining whether to set-up a private foundation. A private foundation provides more control than a donor advised fund. With an advised fund, the donor is technically only making recommendations to a sponsoring organization (like a community foundation) that is managing and distributing the money. In reality, donors’ recommendations are rarely ignored, but there are limitations. For example, donors may not make pledge agreements in a binding way from a donor advised fund because they are not technically controlling that fund. Nor can grants to individuals such as students or specific victims of disasters be made. From an investment standpoint, private foundation donors can control how the organizations’ assets are invested whereas donor advised funds are invested and managed by the sponsoring organization. Of course, the ultimate control over any foundation is the Internal Revenue Service who is concerned about donors using foundations as private slush funds. Donors need to be aware that self-dealing is not allowed. From a practical point of view, many advisers agree that there is a size consideration in determining which type of philanthropic vehicle to establish, since private foundations cost more to maintain. There are no hard and fast rules to determine when a foundation is more cost-effective. The Council on Foundations recommends at least $1 million in assets, while some advisors recommend a minimum of $10 million. There are several reasons for this. To begin with, a private foundation needs to give away at least 5% of its assets each year; a donor advised fund does not. A foundation also needs to earn enough on its investments to cover administrative costs, which, depending on the size and activity, can approach up to 8% a year. Donor advised funds apply the record keeping and financial services of the sponsoring organization to do record keeping and tax filings. Setting up a private foundation often requires legal and accounting expertise, where a donor advised fund is simple to set-up once decisions about fund name, investment options, and successor advisors are made. Additionally, private foundations pay an annual excise tax to the government of up to 2% of their assets. For some donors, a determinant issue is the size of the tax deduction. Donor advised fund holders can write off 50% for cash donations and 30% for securities as opposed to a private foundation, where the deduction is 30% for cash and 20% for securities. In the online world, key facts and documents about foundations are readily available on the Internet. Charity Navigator, GuideStar, and other databases publish I.R.S. filings, annual reports, and even private foundations’ board members. In addition, anyone can search certain criteria, including grant recipients. Donor advised funds can be set-up to protect the donor’s anonymity. Because the Santa Barbara Foundation is a public charity (501(c)(3)), private foundations may make contributions into an advised fund (to make their 5% distribution requirement) and then take their time determining when and to whom to make grants. A very well-known foundation made a substantial gift to a fund at the Santa Barbara Foundation late last year when it became apparent that the timing was not right for them to make their required distribution. A donor with a private foundation is considering setting up a charitable lead trust where the earnings of the trust go into a donor advised fund to support a specific cause. Other like-minded donors can then make contributions to the fund. Upon their passing, the remainder of the trust goes back to the private foundation where the donor’s heirs can continue the stewardship. A community philanthropist has a private foundation and two advised funds. The donor wanted to set-up advised funds to connect with the expertise of the Santa Barbara Foundation’s staff and management around community issues. Having all the facts, the right advisors, and the expertise of the Santa Barbara Foundation all work together to assist donors in creating the charitable giving vehicle that is right for them and for their family. With decades of experience about giving of all kinds, the foundation staff is ready, willing and able to connect with donors to make their philanthropic dreams a reality! Click here to find out more about opening a donor advised fund or call Lynette Dunn, Director of Development or Jessica Sanchez, Donor Relations Manager at (805) 963-1873. Contact our team to help you with your specific needs.